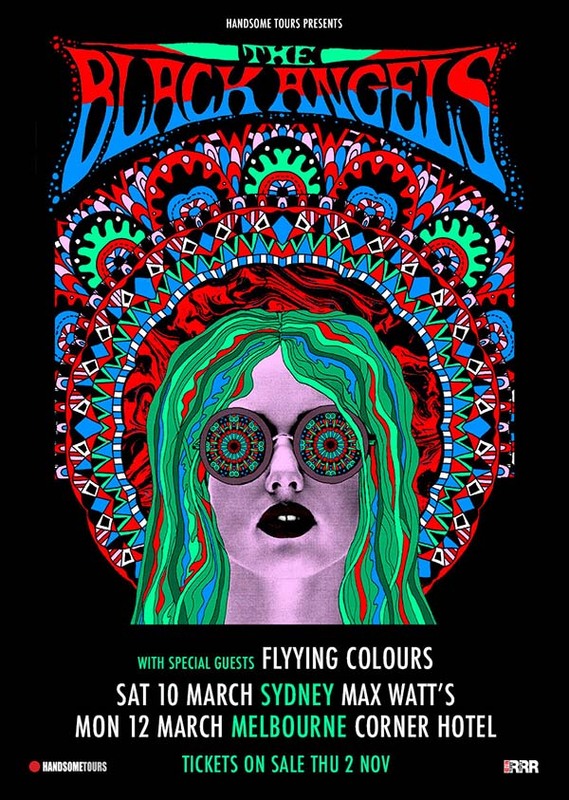 Austin, Texas experimental rock majesties The Black Angels will return to our shores next March. They've announced just two intimate headline dates to complement their appearance at the Golden Plains Festival. Much loved locally for their commitment to balancing psych-rock with rock'n'roll dedication and fearless experimentation, the quintet will be drawing on their fifth studio album Death Song. While The Black Angels' studio discography has earned rapturous attention, their live show elevated the music to new and ecstatic heights. On stage, The New York Times said, they "play psychedelic rock as if the 1960's never ended, and they are absolute masters of it." The band toured with everyone from The Black Keys and Queens of the Stone Age and Wolfmother, in addition to backing psych pioneer Roky Erickson, taking over the airwaves with electrifying television performances on Letterman, Conan, and Austin City Limits, and slaying festival crowds at Coachella, Bonnaroo, Glastonbury, Lollapalooza, Fuji Rock, Primavera, and more. As if performing wasn't enough, The Black Angels co-founded their own festival called Levitation (formerly Austin Psych Fest), which has grown into one of the best-reviewed and most expertly-curated musical gatherings in the country, hosting everyone from Brian Wilson to the Jesus and Mary Chain since launching in 2008. So, what to expect of the self-reflective, intelligent, deeply driven outfit? Searing riffs. Ground-shaking low end. Hypnotic vocals that dive deep into love and loss, social and political illnesses. Romance, violence, religion, health; for The Black Angels, everything is connected. "You can use art to show people how you think the world should be," explains Alex Maas of the band. "You can encourage them to dream what you dream and feel what you feel. If people act on those dreams and give them meaning, artists have the power to change the way the world thinks." These lofty aspirations are painted bravely all over the mesmerising live show that The Black Angels have been peddling since their inception. Come, share in something spectacular with the mighty The Black Angels next March.